Adam Curtis was born on May 26, 1955 in Dartford, Kent, England as Kevin Adam Curtis. He is a director and producer, known for The Power of Nightmares: The Rise of the Politics of Fear (2004), Pandora's Box (1992) and HyperNormalisation (2016). Ann Bernays was previously married to Justin Kaplan. Adam Pascal was born on October 25, 1970 in The Bronx, New York, USA as Adam Jay Pascal. He is an actor, known for Rent (2005), School of Rock (2003) and SLC Punk! (1998). He has been married to Cybele Chivian since December 19, 1998. They have two children. Adam Lawson is an actor, known for A.P.E.X. (1994), SLC Punk! (1998) and Harvey Birdman, Attorney at Law (2000). Alan R. Kessler was born on December 29, 1946 in Beckley, West Virginia, USA. He was an actor, known for The Shawshank Redemption (1994). He died on October 17, 2011 in Mansfield, Ohio, USA. Alonzo F. Jones was born on June 13, 1970 in Providence, Rhode Island, USA as Alonzo Frederick Jones. He is an actor and writer, known for Contrast (2014), Thug Love (2009) and 'Doc' Crow: The Legend of Johnny 2-Strings (2013). Ayinde Vaughan is an actor, known for Whiplash (2014). 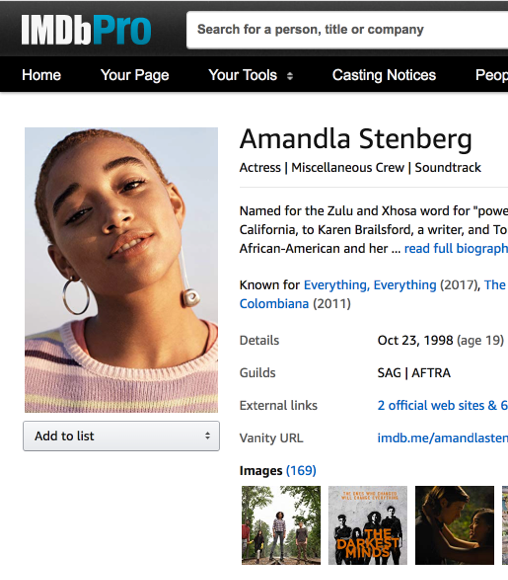 Amanda Newman is an actress, known for Nathan's Kingdom (2018), I Snatched Andy Warhol (2012) and Breezy (2013). Annie Louise Ross is an actress, known for Trainspotting (1996), Whisky Galore (2016) and The Acid House (1998). Andrew Macdonald was born in 1966 in Glasgow, Scotland. He is a producer, known for Trainspotting (1996), Ex Machina (2014) and Shallow Grave (1994). Archie MacPherson was born in 1937 in Glasgow, Scotland. He is an actor, known for The World's Strongest Man (1980), European Men's Football Championships (1960) and Scotsport (1957). Angel Schmiedt is an actress, known for The Truman Show (1998), Holy Man (1998) and Ocean Ave. (2002). Al Foster is known for his work on The Truman Show (1998), Sneakers (1992) and Love & Basketball (2000). Arthur Cartwright is an actor and producer, known for One Day Some Day (2013), Gran Torino (2008) and Scars (2015). Austin Douglas Smith is an actor, known for Gran Torino (2008), The Death of Michael Smith (2006) and The Domino Effect (2012). Andrew Tamez-Hull is an actor, known for Gran Torino (2008) and Inspiration Sensation (2004). Antonio Mireles is known for his work on Gran Torino (2008), Amerikan Violence (2014) and It's a Life Worth Living. Alice Lor is an actress, known for Gran Torino (2008). Arnold Montey is an actor and writer, known for Grayson: Earth One (2013), Star Wars: Extintion (2006) and The Marauders (2013). Albert Kraml is an actor, known for Das Boot (1981). Arno Kral is an actor, known for Das Boot (1981) and Das Boot (1985). Allan Baird is an actor, known for Milk (2008). Ashlee Temple is an actress, known for Milk (2008) and Building Bombs (2000). Awele Makeba is an actress, known for The Legend of Dragoon (1999), Milk (2008) and Have You Heard from Johannesburg? : Apartheid and the Club of the West (2006). Alex Gonzalez is an actor, known for Milk (2008). Anita Bryant was born on March 25, 1940 in Barnsdall, Oklahoma, USA as Anita Jane Bryant. She has been married to Charlie Dry since 1990. She was previously married to Bob Green. Allan Lazo is known for his work on Karma (2011), Goatherder (2011) and Keep Me in the Dark (2012). Annie Lore is an actress, known for Collisions (2018). April Vancelette is an actress and writer, known for Allegro (2019), The Bullet Chronicles 2: Sisters of Pain and Colima (2017). Amron Paul Yuwono is known for his work on Lotus Requiem (2007), Quickie Express (2007) and Kejar Amerika (2004). Allison Bechtel is an actress, known for Van-Jean (2013) and American Psyche (2007). 48. Alfred G. Davis Jr.
Alex Graves is a producer and director, known for The West Wing (1999), Game of Thrones (2011) and The Crude Oasis (1995). Antoinette Montgomery is an actress, known for House of Cards (2013), Miss Virginia and For My Man (2015). Alexis Nichole Smith is an actress, known for House of Cards (2013), Loserville (2016) and Tryst (2015). Andrea Leigh is known for her work on The Punisher (2017), I'm Not Done (2014) and Eastern Citrus. Alexander Sokovikov is an actor, known for House of Cards (2013), Staties (2018) and The Americans (2013). Alok Tewari is an actor, known for Brooklyn's Finest (2009), Law & Order: Special Victims Unit (1999) and Homeland (2011). Andre Ware was born in August 1965 in Kalamazoo, Michigan, USA. He is an actor, known for Cradle 2 the Grave (2003), Die Hard: With a Vengeance (1995) and Ultimate Avengers (2006). Ann Curry was born on November 19, 1956 in Agana, Guam. She is an actress and producer, known for 30 Rock (2006), Law & Order: Special Victims Unit (1999) and Dateline NBC (1992). She has been married to Brian Wilson Ross since October 21, 1989. They have two children. Alie Urquhart is an actress, known for House of Cards (2013), Don't Look Back (2014) and Little Monsters (2014). Altorro Prince Black is an actor and director, known for House of Cards (2013), City of Lost Souls (2014) and Drakul (2017). Albert Jones is an actor, known for The Bourne Ultimatum (2007), American Gangster (2007) and Salt (2010). Andy Murray is an actor, known for Run All Night (2015), Forever (2014) and Elementary (2012). Amy Parrish is known for her work on Ozark (2017), Stranger Things (2016) and Good Behavior (2016). Alfredo Narciso is an actor and producer, known for Manifest (2018), The Dark Tower (2017) and Homeland (2011). Andrea R. Baker was born as Andrea Rose Baker. She is an actress and producer, known for The Replacements (2000), Ninjas vs. Monsters (2012) and The Sick. Ashleigh Michèle McGill is an actress, known for Perimeter (2019), Facade: Chapter 4 and House of Cards (2013). Alisa Anderson is known for her work on The Alpines, Somerset Rd. and House of Cards (2013). Ava Del Cielo is an actress, known for Whiskey Tango Foxtrot (2016), Operation Grid and Running with the Devil. Antonio Suarez is an actor, known for House of Cards (2013), Flight of the Conchords (2007) and The Light of Eons (2005). Anne Rutter was born in January 1939 in London, England as Pamela Anne Rutter. She is an actress, known for The Avengers (1961), Miss Marple: The Body in the Library (1984) and Special Branch (1969). She was previously married to Malcolm Taylor. Art McFarland is an actor, known for Law & Order: Special Victims Unit (1999), House of Cards (2013) and Political Animals (2012). Al Nazemian was born on March 30, 1974 in Iran. He is known for his work on Blue Bloods (2010), Damages (2007) and House of Cards (2013). Aurelio Dominguez is an actor, known for By the Grace of Bob (2016), House of Cards (2013) and Mum (2014). Ari Melber was born on March 31, 1980 in Seattle, Washington, USA. He is an actor and writer, known for House of Cards (2013), The Beat with Ari Melber (2017) and The Cycle (2012). Amy Tribbey is an actress, known for The Americans (2013), Gotham (2014) and Person of Interest (2011). Amy Hohn is an actress, known for Premium Rush (2012), War of the Worlds (2005) and Hitch (2005). Angela Reed is known for her work on Daredevil (2015), The Blacklist (2013) and Law & Order: Special Victims Unit (1999). She has been married to Todd Cerveris since June 13, 2003. Anne Bowles is an actress, known for TURN: Washington's Spies (2014), House of Cards (2013) and The Good Wife (2009). Angela Gollan was born as Angela Dawn Gollan. She is known for her work on House of Cards (2013) and Groundhog Day (1993). Artie Brennan is an actor and producer, known for American Genius (2015), House of Cards (2013) and The Affair (2014). Amanda Warren is an actress, known for Three Billboards Outside Ebbing, Missouri (2017), The Leftovers (2014) and Black Mirror (2011). Angela Christian is an actress, known for House of Cards (2013), Law & Order: Special Victims Unit (1999) and Forever (2014). Andrew Kober is an actor, known for Boardwalk Empire (2010), Pan Am (2011) and House of Cards (2013).